Yesterday was our 7th wedding anniversary. SP took the day off, not so much because it was our anniversary but because we had a very busy weekend, he had a doctor appointment in late morning, and this way we could spend some time together and go out to dinner and celebrate a bit. Neither of us wanted an expensive, fancy meal. SP said he wanted a good pizza. 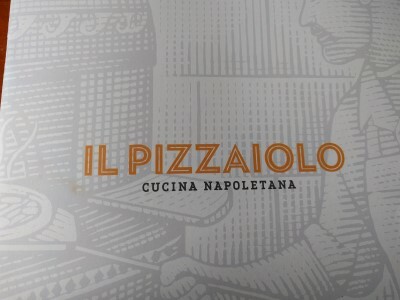 So we thought about it, ruled out traveling into the city, and decided to go to Il Pizzaiolo in Mt. Lebanon. It's been a while (years) since we've dined there. 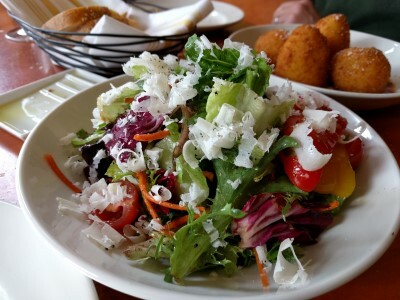 Insalata Misticanza (mixed greens, tomatoes, roasted peppers, olives, carrots, red wine vinaigrette with Parmigiano-Reggiano). Really tasty salad and a nice size for us to split. 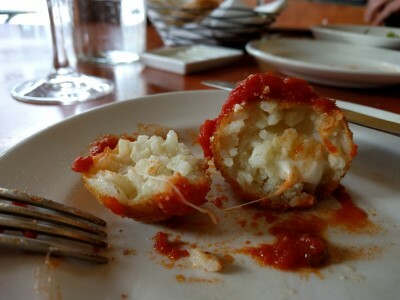 Arancini (Sicilian and Neapolitan fried rice balls). 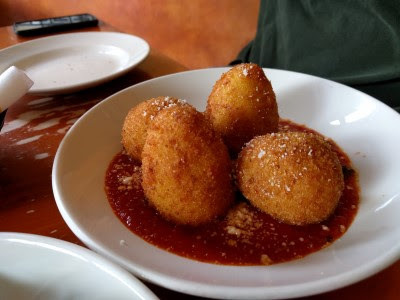 The smaller ones had cheese inside. The larger, oval shaped ones had meat & peas inside. Melted cheese inside - yum! Stracciatella (Stracciatella di Burrata, fresh cherry tomatoes, Sicilian sea salt, basil, extra virgin olive oil, Prosciutto di Parma). This was delicious. 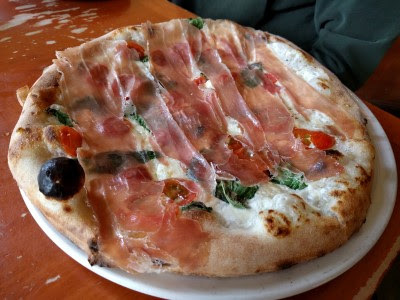 It was a pizza full of a few of my favorite things: burrata, tomatoes, basil, prosciutto. Salsiccia (San Marzano D.O.P. 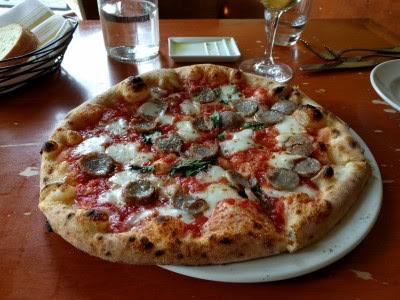 Tomatoes, Fior di Latte, sweet fennel sausage, Pecorino Romano, basil, extra virgin olive oil). This was also a very tasty pizza, more traditional. The tomatoes were so sweet and flavorful. The sausage was how I like it, not too sweet, not spicy, light fennel flavor, good sausage flavor. Really good. We couldn't decide which pizza we liked better. I wasn't going to pass up Tiramisu. 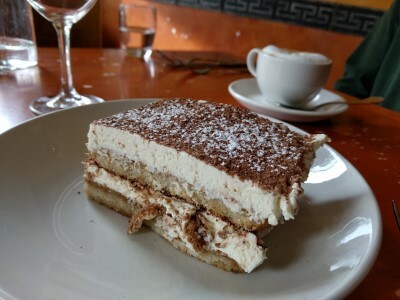 It was a large piece of tiramisu, good for sharing, light and delicious. 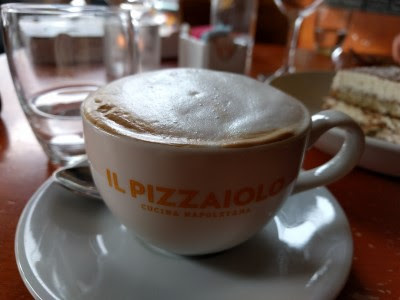 Cappuccino to finish the meal and relax. Il Pizzaiolo does not take reservations. We had some errands in the area and one was going to a store (not in a mall) before it closed, so we ended up having an early dinner, arriving around 5 pm. 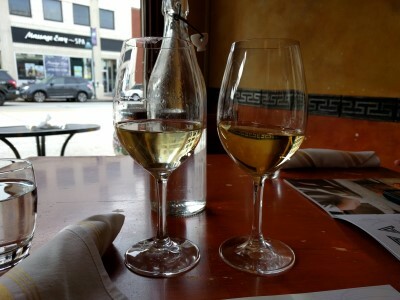 We were given our choice of seats and chose a table by the front window, looking out on Route 19. Our server was fantastic, very friendly and helpful (our table was a little wobbly, he noticed and fixed it for us). 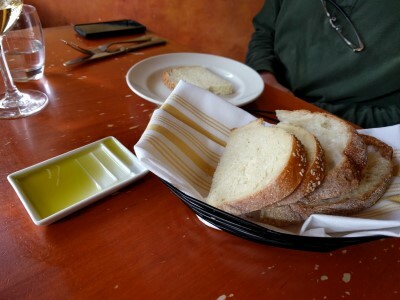 I remember being a little disappointed the last time we were at Il Pizzaiolo (again, years ago) but this time, we both were very happy with the service and food. A delicious anniversary dinner. I can't wait to eat the leftover pizza. And then go back for more.